In view of the fact that over 70% fatally injured in road traffic incidents, were of working age, the actual economic damages include losses associated with non-produced intellectual and tangible product. In Russia Yekaterinburg is in first place by the total number of deaths per 100,000 inhabitants. And the number of accidents is second only to cities like Moscow and Saint Petersburg. In recent years there has been a fairly steady increase in the number of child victims in this cases, at the same time the total number of children in the country decreases. The increasing number of serious injuries also should be noted, evidenced by the changes in the ratio of the number of dead and wounded. According to the official data of the State Traffic Safety Inspectorate there is an increasing number of road traffic incidents with children in Sverdlovsk region. For 2 months of 2009 in the Middle Urals 86 accidents involving children were recorded, which is on 19.4% more than the same period last year. The most common cause of accidents is failure to observe basic rules of the road – 73.1% of the total number. The reasons for traffic violations are different - and this ignorance and unwillingness to comply with traffic rules due to lack of understanding the importance of these simple but very important rules. 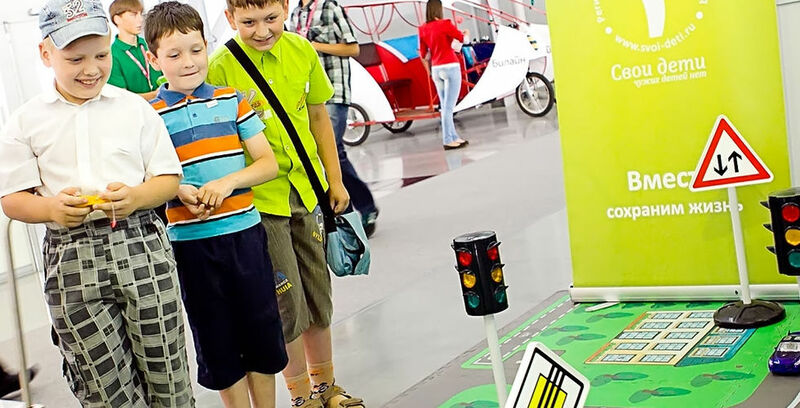 The aim of the project «Our own safety culture» is lowering the level of child injuries on the roads of the Sverdlovsk region. To solve the problem of child injury on the roads is possible, forming culture of safe behavior on the road. For achieving the results, students of the Faculty of Life Safety regularly developed scenarios of cultural events (KVN, fun starts, quizzes, etc.). - To form an idea about safe behavior on the road and public transport. Download programs passport "Our own safety culture"